There will be a major change to Howard University’s homecoming this year. Yardfest, an annual staple highlighted by a concert that has featured many of hip-hop’s biggest names, will not include live musical performances. In their place will be sets by celebrity DJs Biz Markie, DJ Quicksilva and DJ Drama. A separate hip-hop concert featuring rappers Dom Kennedy, Fabolous and others will be held at the D.C. Armory the next day, Oct. 18. This comes a year after Yardfest made headlines when crowd-control issues resulted in nine injuries — including to two police officers — when concertgoers who were unable to get in rushed the gates. “It was the university’s decision to make sure what happened last year didn’t happen again and that we aren’t branded in that negative light,” said Zenani Greenwell, this year’s homecoming coordinator. Although Yardfest had historically been a free event, the school charged $5 for admission to the 2013 festival. The fee was small, but the move displeased many alumni and members of the student body. 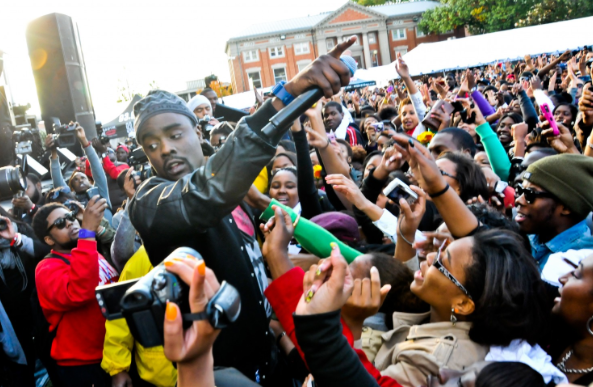 The Yardfest concert had attained legendary status both in the District and in the wider hip-hop universe, over the years hosting performances by the likes of Jay Z, Kanye West, Notorious B.I.G. and many more. This year’s Yardfest will be free and will feature food and merchandise vendors. The committee also decided to up the family-friendly quotient by including a face-painting station and carnival games. Greenwell is optimistic about the new layout and said it will be more welcoming to groups that were hesitant about attending what was essentially an annual outdoor hip-hop festival. “A lot of members of the community and alumni complained that they couldn’t bring their kids, aunts or uncles because it was such a student concert,” she said. For students and recent graduates looking to recreate the Yardfest experience, there is Mecca­Fest, a new outdoor music festival at the St. Elizabeths East Campus in Southeast Washington, hosted by a group of Howard alumni called the Culture Collective. Partnering with several local groups, including radio station WPGC (95.5 FM) and Gateway DC, the group is offering an event featuring performances by Future, Elle Varner, Jeremih, Backyard Band, Rae Sremmurd and more — a lineup not unlike one you might see at a Yardfest concert. Ticket prices range from $25 for general admission to $80 for VIP access. Although the event is being thrown by Howard alumni and is called MeccaFest (one of Howard University’s nicknames is “the Mecca”), the group stresses that the event is not affiliated with the school or Howard University’s homecoming and is not intended to replace Yardfest. “The event we’re throwing was not created with one school in mind. We want to unify these schools for their individual homecomings,” says MeccaFest’s media relations director and 2011 Howard graduate LaMont Russell, pointing out that several schools, including the University of Maryland, are celebrating their homecomings that weekend.